As a part of meeting the requirements of the Clean Water Act permit held by RVSS, we educate residents within our jurisdiction to protect water quality. Towards this end, RVSS partners with several local entities including Jackson Soil and Water Conservation District, Rogue Valley Council of Governments, and the Rogue River Watershed Council to develop and deliver programs and materials to help residents understand how they can reduce polluted runoff. Contact us at 541-664-6300 if you are interested in stormwater education for your group or event. We can design a program that will meet your audience's interests, whether they are adults or children. A series of educational brochures on stormwater quality topics are available for your use. Hard copies can be obtained from RVSS. "Stream Smart" is a project undertaken with our partners to provide lots of great information and resources on how individuals can influence the quality of stormwater runoff, to provide "Cool, Clean Water for Life". Stormwater Model - RVSS has a model and activities perfect for demonstrating what a watershed is, where stormwater runoff flows and where pollution comes from in a watershed. We enjoy talking about water and watersheds and can come to your classroom or event. Contact us at 541-664-6300 to schedule a date. Stormwater Model - RVSS has a stormwater model and activities perfect for demonstrating what a watershed is, where stormwater runoff flows and where pollution comes from in a watershed. We can come to your classroom or event, contact us to schedule a date. Salmon Watch – RVSS provides funding and assists in coordinating this field program aimed at teaching upper elementary and middle school students about salmon biology and habitat and how they are affected by stormwater pollution. Classes are typically offered in the fall and held at a streamside location so students can view migrating salmon. Contact us at 541-664-6300 to find out about availability. Salmon Watch – RVSS provides funding for this field program aimed at teaching 4th and 5th grade students all about salmon biology, habitat, and how they are affected by stormwater pollution. Classes are typically offered in the fall and held at a streamside location so that students can view migrating salmon. Contact us to find out about availability. RVSS maintains active membership in the following organizations with the aim of staying informed of and participating in legislation, events and happenings at the state and local level that impact stormwater management. RVSS conducts creek walks in the summer to identify sources of pollution in our creeks. When a source can be identified, RVSS works to eliminate it. RVSS also responds to illicit dumping into the stormwater system. If you see pollution entering a stormwater drain or creek, contact RVSS 541-664-6300. RVSS conducts creek walks in the summer to identify sources of pollution in our creeks. When a source can be identified, RVSS works to eliminate it. RVSS also responds to illicit dumping into the stormwater system. 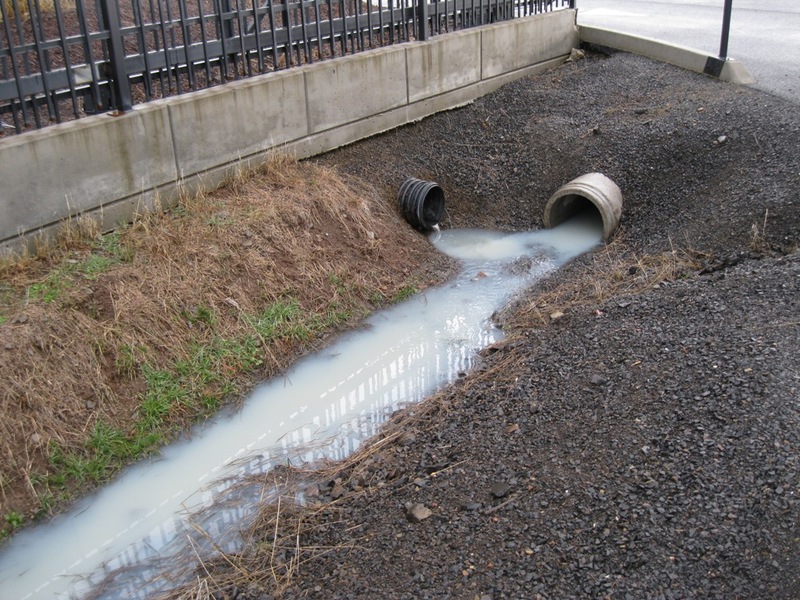 If you see pollution entering a stormwater drain or creek, contact RVSS at 541-664-6300. Stormwater runoff from developments that have been built since 2007 must be managed to remove sediment, oil and grease. See the Development in Phase II page for more information on stormwater management requirements. RVSS maintains mechanical stormwater features located in the right-of-way.